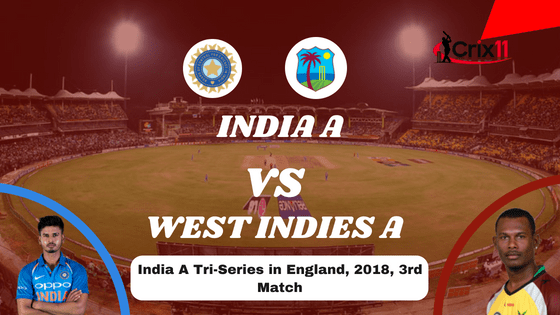 India A vs Windies A, who will win? If you are looking for the match prediction then you are at right place. In Today’s Dream11 Fantasy Cricket Match Prediction of IND-A vs WI-A 3rd ODI, we will cover probable playing 11, fantasy cricket news, toss prediction and pitch report of Grace Road, Leicester. Who Will Win the 3rd ODI Match, Between IND-A vs WI-A and Toss Prediction? Where Can You Watch the Live Streaming of WI-A vs IND-A, 3rd ODI or Channels to Watch? India-A and West Indies-A, both the teams have lost their first match. Both the teams will try hard to register their first win. Both the teams have potential to win today’s match. According to our astrology prediction, IND-A will win the match. The team winning the toss should opt to bowl first as chasing is easier as compared to batting first. According to our astrology prediction, WI-A will win the toss and ask IND-A to bat first. Date: The match will be played on 25th June 2018 (Monday). Match: India A Tri-Series in England, 2018, INDA vs WIA, 3rd Match. Time: 10:00 AM GMT, 03:30 PM IST and 11:00 AM Local. The pitch of Leicester, Grace Road, is a batting friendly. The last match IND-A played here scored 458 runs. If you look at the last four matches played on this ground, two matches were 300+. The batsmen will enjoy batting here and huge run is expected on this ground today. It is forecasted to be a sunny day throughout the day. The sky will be clear and there is no sign of rain. The cricket fans and fantasy users can enjoy the full match. The temperature is expected to be 21-Degree Celsius and humidity to be 44%, which may rise up to 50%. Note: Due to the sunny weather the spinners will get some extra help and seamers will have a tough time. The average first inning score of this ground is 217. The average second inning score of this ground is 145. Highest total on this ground is 377/7 in 50 overs by ENGW vs PAKW. Lowest total on this ground is 48/10 in 25.2 overs by WIW vs RSAW. In the last five matches, INDA has won two matches out of five matches whereas WIA has also won two games out of five games and one game was abandoned. India A has lost the last two games back to back. Windies A has won the last match by 45 runs. If you are searching where to watch the live match of WIA vs INDA then you should be aware that, this match will not be broadcasted on any channel. Still, if you want to watch the live match then we have a solution for you. You can watch the live streaming on Leicester County Cricket Club digital platform (Website). India A had a great start of the series. They have won both the practice match and scored 300+ runs in the practice matches but they failed to win the first match. They can make a couple of changes in their team. Prithvi Shaw, Mayank Agarwal, Shubman Gill, Shreyas Iyer (c), Rishabh Pant (wk), Vijay Shankar/G H Vihari, Krunal Pandya, Axar Patel, Krishnappa Gowtham, Deepak Chahar, Shardul Thakur. Deepak Chahar, Krunal Pandya, Deepak Hooda, Prasidh Krishna, Mayank Agarwal, K Khaleel Ahmed, Vijay Shankar, Shubman Gill, G H Vihari, Prithvi Shaw, Krishnappa Gowtham, Shardul Thakur, Ishan Kishan, Axar Patel, Rishabh Pant (wk), Shreyas Iyer (c). Windies A started their campaign losing their first practice match but the managed to win the second practice match. They also lost against England Lions. Chandrapaul Hemraj, Jermaine Blackwood, Devon Thomas (wk), Jason Mohammed (c), Sunil Ambris, Rovman Powell, Rahkeem Cornwall, Raymon Reifer/Keemo Paul, Dominic Drakes, Jomel Warrican, Chemar Holder/Oshane Thomas. Jason Mohammed (c), Keemo Paul, Dominic Drakes, Devon Thomas, Oshane Thomas, Andre McCarthy, Chandrapaul Hemraj, Sunil Ambris, Jermaine Blackwood, Rahkeem Cornwall, Chemar Holder, Raymon Reifer, Rovman Powell, Jomel Warrican. Fantasy Cricket Expert Tips: You can select Rishabh Pant over Devon Thomas. 92.71% of the Fantasy users have selected Rishabh Pant in their dream11 Team and 6.69% of the users have selected Devon Thomas in their dream teams. Make a combination of the above players for multiple teams. Fantasy Cricket Expert Tips: The above players are most likely to score runs. Make a combination of the above players for multiple teams. Fantasy Cricket Experts Tips: The above all-rounders are most likely to contribute with the bat and ball. Make a combination of the above players for multiple teams. Fantasy Cricket Expert Tips: The above players are most likely to perform today. You can take them as a captain and vice-captain. You can also take captains from key players. Fantasy Cricket Expert Tips: The above players have performed in the previous matches. You can take them as a captain and vice-captain. The pitch will favour the batsmen, so try to take top order batsmen in your teams. As it is expected to be a sunny day, the pitch may support the spinners in the latter half of the game, make sure to take spinners in your teams. Conclusion: This is it for Today’s Dream11 Fantasy Cricket Match Prediction of IND-A vs WI-A, 3rd ODI Match, which will be played on Monday 25th June. We have covered all the details required to win any fantasy leagues. We have covered players recent and past performance, dream11 guru and crictom prediction, all the latest news and updates of Australia Team and England Team, weather report of Nottingham, dream 11 best teams, keys players, the best choice for captain and vice-captain, where to watch the live match of WI-A vs IN-A, 3rd ODI and the details of live streaming of India A Tri-Series in England, 2018.